When you’re planning to have a luau party, then you just need to think Hawaiian. A luau is how they party in Hawaii after all. So if you want to have a party with a luau theme, just go tropical. It’s important that you set the decorations, the clothes, the food, and the music. Step 1: Get luau invitations. Since luaus are one of the common party themes nowadays, you can find several luau invitations in bookstores and card shops. You can also look for luau invitations online, or better yet, you can design one yourself. Step 2: Prepare the luau scene. The scene is Hawaii, so better bring as much of the surf and tropics with you in your party setting. You can decorate tables with grass skirts, palm leaves, and banana leaves. You can use wooden utensils and tropical-themed plates and cups. 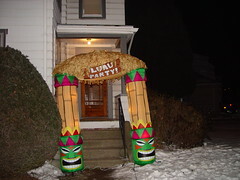 Or, buy tiki torches for a more Hawaiian feel and inspiring beach sensation to your party scene. Step 3: Ask the guests to go Hawaiian. You should lead the pack by making suggestions. Request that your guests come in Hawaiian shirts and Hawaiian-themed clothes. They can wear board shorts and beach sandals for a more seaside atmosphere. You can also prepare grass skirts and leis to give out to guests as they arrive. Step 4: Bring out the drums and ukuleles. Part of the ambiance is the music, so better get a CD with Hawaiian music on it. If you have the cash to spend, you can hire a live band and Hawaiian performers to your party. The food also determines the mood of the party. Prepare food that are traditionally served at luaus, such as the kalua pig, haupia, poke, and, of course, the luau. There are several other dishes that you can prepare yourself or buy at supermarkets. You can find several luau recipes online. Once you have all the conditions met for your planned luau party, then go ahead and have a blast. It doesn’t matter what the occasion is, you can hold a luau for birthdays, baptisms, and even engagement and wedding receptions. If you want to give your friends and family a different experience from the traditional parties, then a luau party is a great idea. Not only will it give your guests a new perspective, but a luau party can be so much fun as well. Post-party Clean-up – Party at home and other related things. Putting Wallpaper Properly – Preparing for a party at home. Birthday Party Preparation – Preparing for a party or celebration. Cooking Tips – Party-related ideas and activities. Hosting Dinner Party – Doing preparation for a special event. It also helps when you’ve attended luau’s before, so that you’ll have an idea on how it is held. It is okay if you haven’t since there are a lot of videos within the confines of the world-wide-web which shows you luau’s in and out of Hawaii. As much as possible go Hawaiian, from food, lightings, attire and music to recreate the feeling of being in the tropical seas of probably the worlds most famous tropical island. This can also be great if you’re planning a welcome party to someone who is a native of Hawaii so that he will feel more comfortable and be right at home. It is not a party without drinks. Ask your friends or research the internet on some cocktail drinks you can serve in your Luau Party. Just make sure that you also serve non-alcoholic drinks for your minor guests. Some of the best cocktail drinks are Mai Tai which is a rum-based concoction or a blue Hawaiian. It is best to prepare your drinks in a big punch bowl with lots of ice instead of individual drinks. Guests will surely enjoy themselves by meeting other people in the drinks table. A Luau party is usually done during special celebrations. It may include, wedding, birthday or graduations. The highlight of a traditional luau parties is a kalua pig. But you can opt to take advantage of a luau catering to avoid the hassle of preparing everything by yourself. Decorate your place with fresh flowers, coconuts and pineapples for a real hawaiian touch. You can search for tahitian groups to perform in your luau party to entertain your guests. You can also make your guests wear lei for added Hawaii feel. A traditional hawaiian necklace that can be made from flower or shells.